NOW–Sunday, Jan. 27, 2019 The ICE at Discovery Green is the largest outdoor ice skating surface in the Southwest, and is walking distance from our Houston luxury apartments. One of the most popular December activities to go with friends, family or your significant other, you can’t miss this festive ice skating event for only $15, which includes your skate rentals. Guests can also skate with Santa on Saturdays, from now until Christmas from 5-6pm, so plan accordingly. Talk about an epic Christmas card! All December Just a few blocks from our luxurious downtown Houston apartments is one of downtown’s best hotels, Four Seasons Houston. The staff here goes all out, always. If it’s baseball season, you better believe they’re holding the doors open in their best Astros gear, and the holidays are no exception! Talk about photo opps galore at this local hotel. Want to see a two-story massive Christmas tree? You’ll need to head to the second floor to catch a glimpse of the whole thing! Need to book reservations for Christmas Eve or Christmas Day Dinner? You can join them for a festive feast (learn more on their event page) and they’ll do all the cooking and cleaning up for you! Want to partake in a proper Holiday Tea? Visit Four Seasons every Saturday in December to catch live piano music, sip on Prosecco, make holiday ornaments and more (more info). Four Seasons Houston has a ton of holiday events, but just swinging by their lobby will put you in the holiday spirit in no time. You’ll love their decorations, we promise! Now – January 19th, 2019 This isn’t technically downtown, but it’s less than 15 minutes away and had to make our holiday list! Zoo Lights at the Houston Zoo are a holiday tradition that’s been going strong for seven years and still one of the most popular in town. Choose from Value Nights or Prime Nights and reserve your tickets online for a festive display of holiday lights alongside some of the furriest zoo animals. Don’t forget to come hungry because you can make your own s’mores and grab other snacks at snack carts scattered throughout. The good thing about Zoo Lights is that if the actual holidays are already too jam-packed or you’re traveling, you still have 19 days into 2019 to enjoy the festivities before they’re packed up. 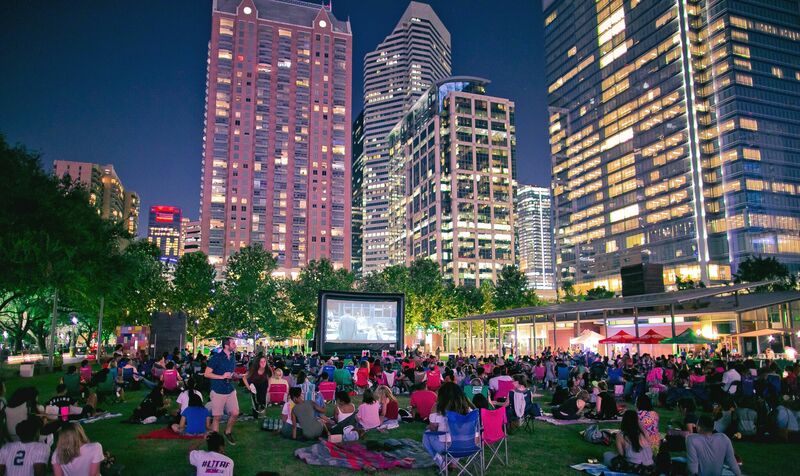 December 13 and 20, 2019 If you’re a movie buff, especially around the holidays, gather up the family and head back to Discovery Green to enjoy family-friendly holiday movies on the lawn with a view of Houston’s beautiful skyline. Movie guests are encouraged to bring blankets or lawn chairs and arrive early for fun contests and activities, making this one of the most family-friendly events in all of Houston. Be sure to add these last two holiday dates to your calendars: December 13th (A Nightmare Before Christmas) or December 20th (Polar Express). Of course if you can’t make these movie dates, you can plan your own date night inside your cozy apartment at 500 Crawford. December 21, 2019 Less than two miles from 500 Crawford you’ll find one of Houston’s top breweries, St. Arnold’s. Join them for their 3rd annual event, perfect for beer lovers, all a quick ride-share away from home. Check out our downtown Houston event calendar for even more stuff to do this month! If you’re interested in a private tour of our Houston apartments downtown, visit us at 500 Crawford Street, across from Minute Maid Park or call us at 713.222.0500 today to hear about our current holiday leasing specials. This month only, we are running major specials and discounts on our two-bedroom units. You can also take our virtual tour if you’re daydreaming about your next Houston home that comes with so much downtown Houston fun right outside your door.